This is a great one to do if you have kids and want something fun to do with them that they can actually help with. Plus, it is super easy, super quick, and yummy! Any other toppings you might want. I used pepperoni this time. Heat oven or toaster over to broil. 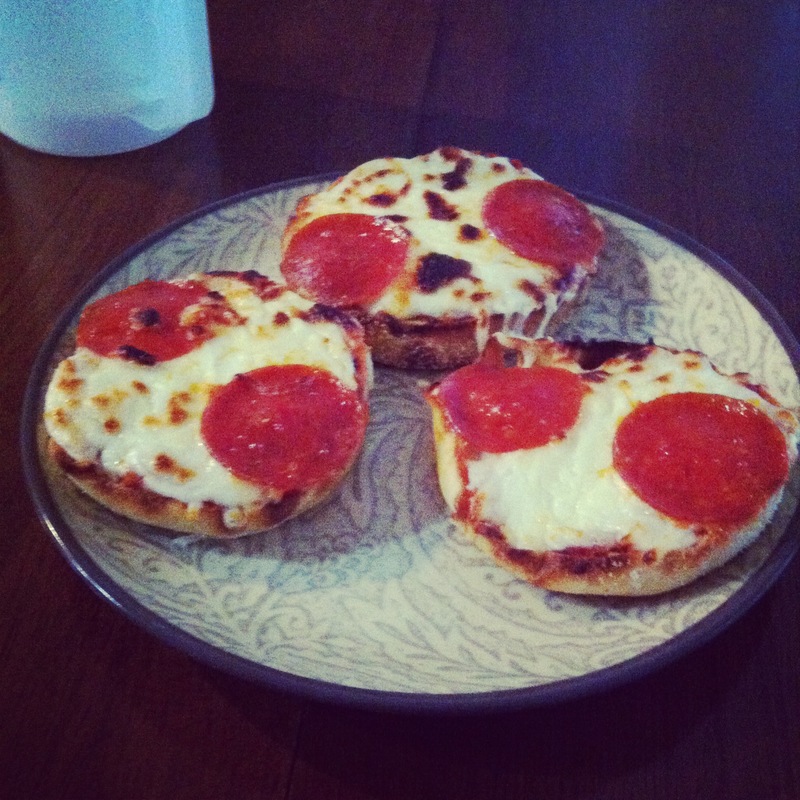 Spread pizza sauce over toasted muffins. This recipe was EASY, YUMMY, and made a TON for leftovers which equals more money in my pocket, which is always a good thing. It is kind of a mixture of regular spaghetti with a kind of lasagna feel. Brown meat. I added some Italian seasoning, garlic salt, and pepper to taste. Add sauce and about a 1/3 of Parmesan cheese. Mix. Put into 13X9 pan and top with a generous amount of mozzarella cheese and a little bit more Parmesan cheese. Bake for 20 minutes or until cheese is melted and starts to brown. I served with garlic toast. Like I said this was super easy and yummy. My daughter loved it and my husband took it for lunch for 2 days and we had it for leftover dinner one night. When I do it again, I think I will mix mozzarella into the meat and sauce mixture and add more Parmesan on top. OK, this one was a little bit more ambitious than a crock pot recipe. First of all, there are multiple things going on at once and multiple trips inside the oven. I did this for a Friday night meal, wouldn’t do that again because I missed out on all the weekend relaxing night time! Second, it was good. But not knock my socks off. The men liked it a lot better though. Cook ground beef and rice. Preheat over to 400 degrees. Lightly coat the peppers with olive oil and bake for 20-25 minutes. They will start to brown on some edges and the bottom. Let them cool slightly. While the peppers are cooking, saute onions until see through. Combine taco seasoning, ground beef, onions, black beans, and salsa. Mix. Fill the peppers generously with the mixture. Cook for an additional 15-20 minutes. 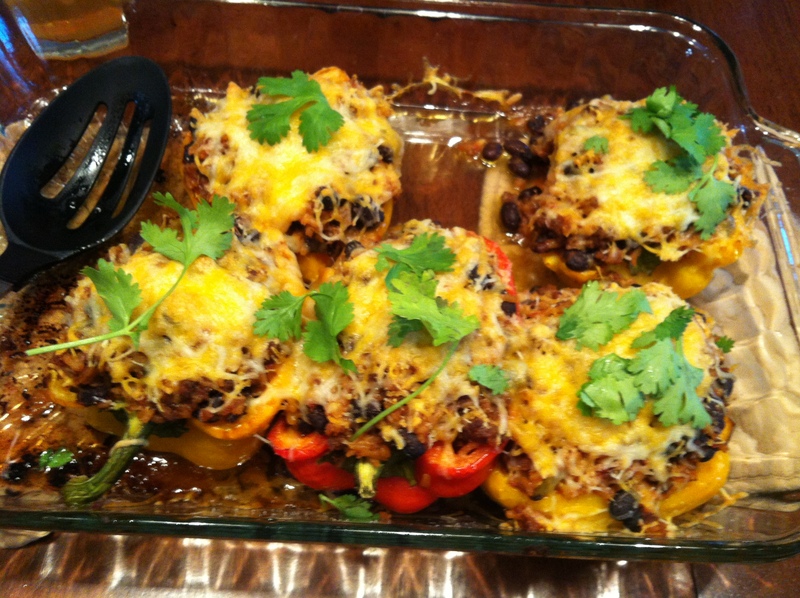 Top each pepper with the shredded cheese put back into the oven until melted. Top each pepper with cilantro and sour cream. Granted not THAT complicated, but not as easy as I tend to do. Not one that after it was over did I say, Wow that was worth all that effort. Like I said it was good, just not fabulous. Enjoy!!! Whew, that is a mouthful. This is a recipe I found online a few years ago, but I did not save the source. I kinda tweeked what was I saw online and made it my own, but if you know the original source, let me know! Ok, I searched forever trying to find a chicken spaghetti recipe that I would like. 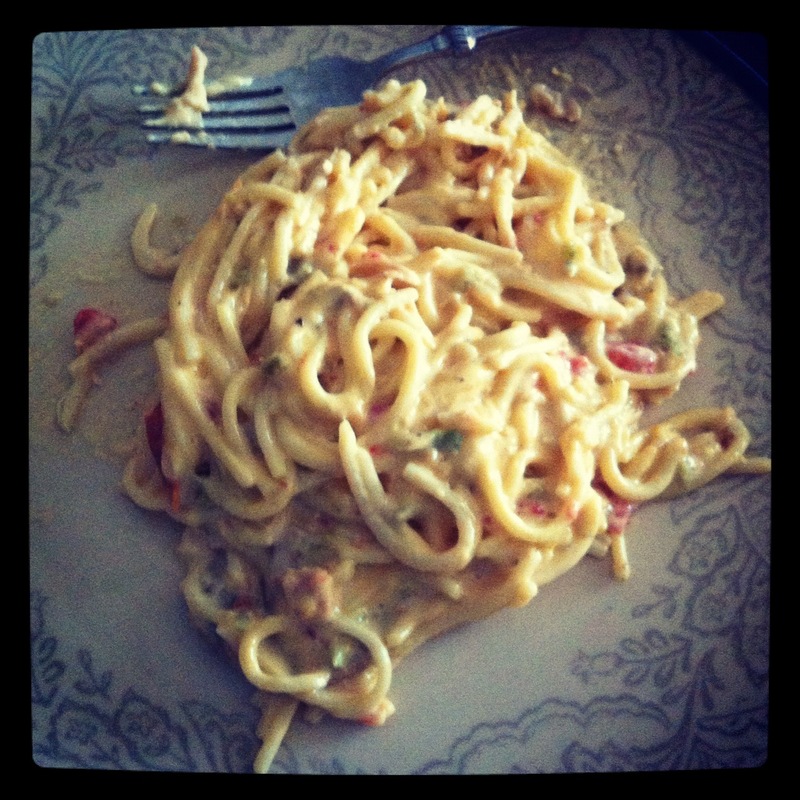 Before this recipe all I had ever had was bland boring disgusting chicken spaghetti. I was determined to find something that was edible and easy and that’s when I found this. Since then, it has become a hit among friends and family and is a staple in our house. It is one of my top favorite meals of all time if that tells you anything. It is not very kid friendly because it is a little spicy, at least my three year old will not eat it, but maybe your kids will like it better. Spray large crock pot with cooking spray. Combine all ingredients making sure they are mixed well with pasta. Cook on low for 2-3 hours. This gives me and my husband lunch for the next day too. Makes A LOT so make sure to invite friends over if you don’t have a lot of people in your family. 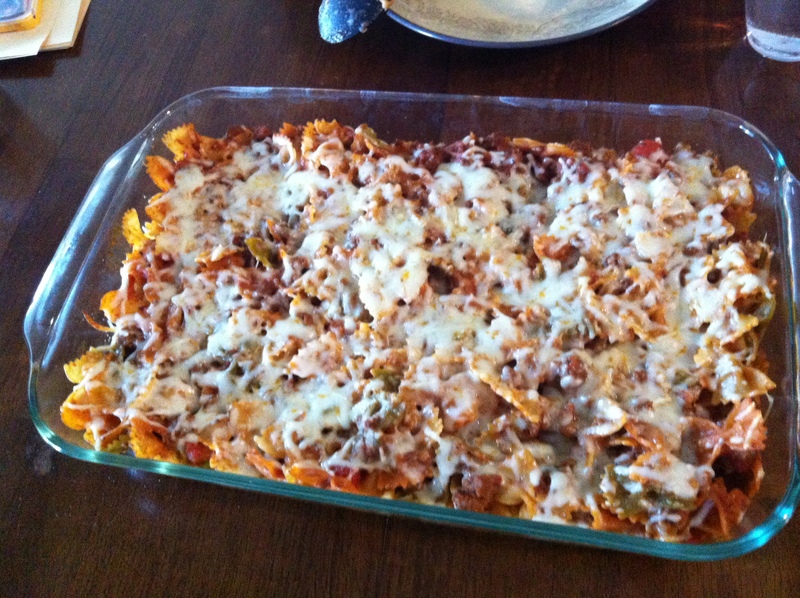 This is one of my husbands all time favorite things that I cook and I give it 5 out of 5 stars.